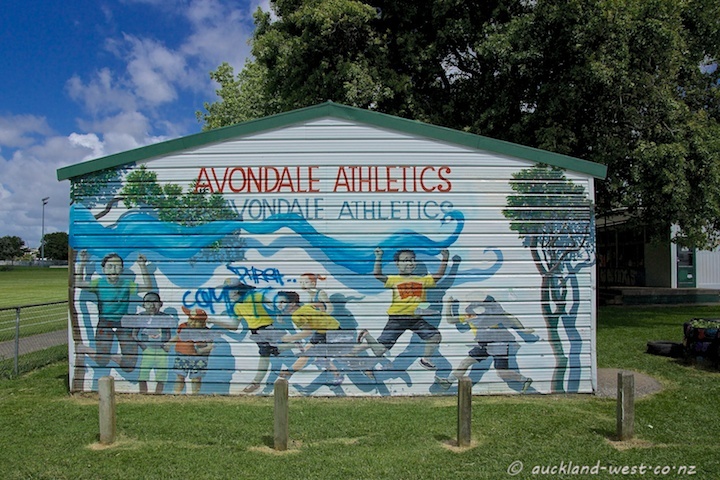 The club room of Avondale Athletics next to Eastdale Reserve, Avondale. Painted by Doug Ford. 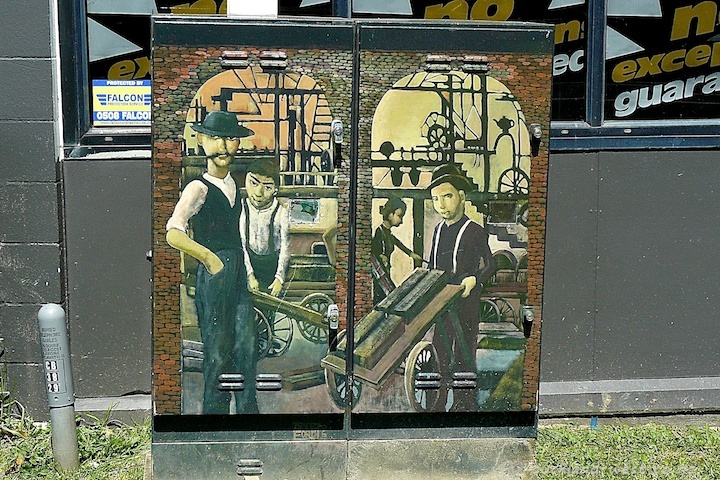 Doug Ford has painted a number of traffic control cabinets in the New Lynn area. Some of them have already fallen victim to progress, be it in the form of street re-alignments, or technological improvements, not to mention traffic accidents. This stands in a pretty safe position at the corner of Great North Road and Delta Avenue. It shows the early brick and earthenware industries which were a major part of the early life in this region of Auckland. 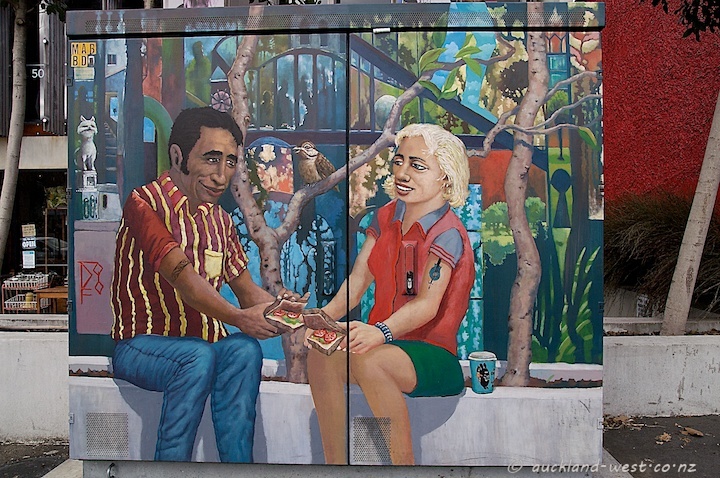 Happiness is — sharing sandwiches? 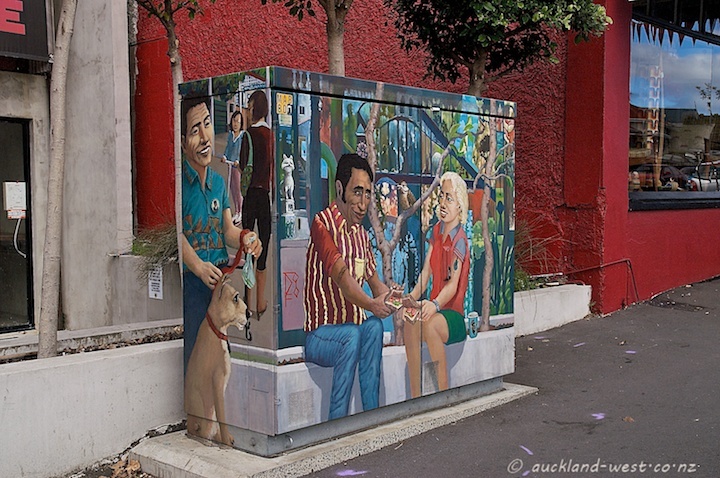 This telecommunications cabinet stands next to Mac’s Neighbourhood Brewbar in Kingsland, and I am sure that they would prefer the locals to partake of their pub platters, rather than sharing cut lunches out on the footpath. 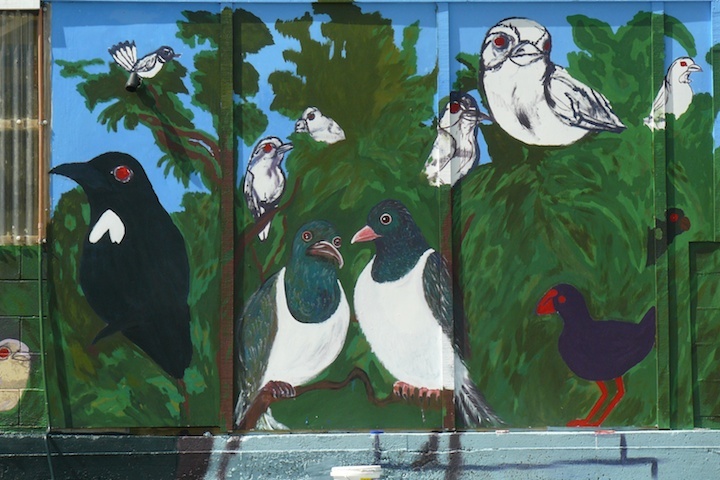 Street scenes and birdlife in Doug Ford‘s typical style. 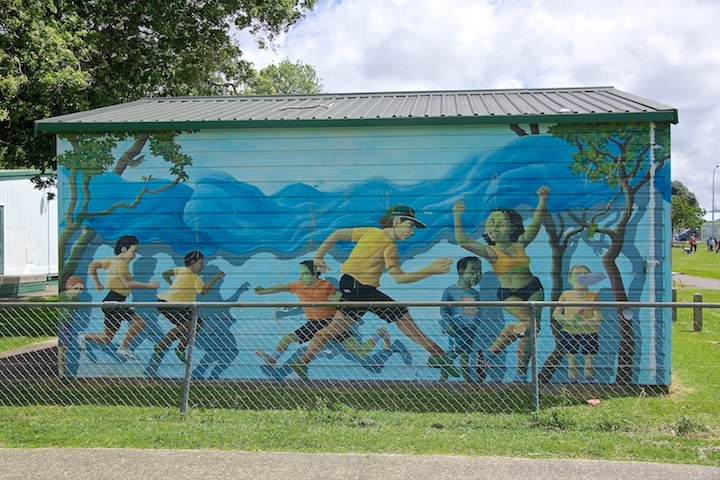 Doug Ford has featured on this blog before, as creator of murals and numerous painted roadside cabinets (telecommunications and traffic control). 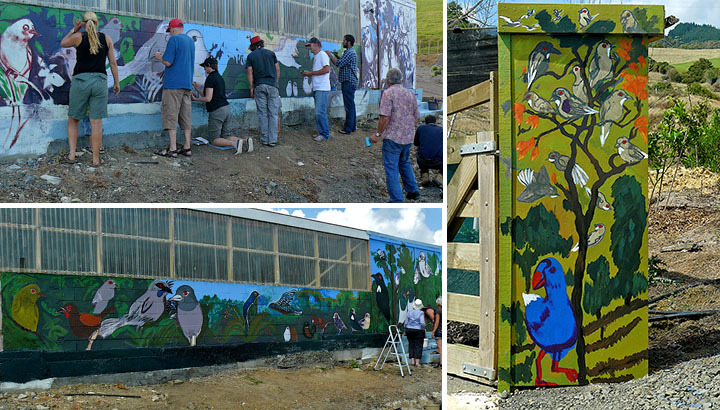 Last Saturday we had the opportunity to paint a mural under his guidance at CUE Haven, a former farm along the Kaipara Coast Highway, between Kaukapakapa and Glorit. 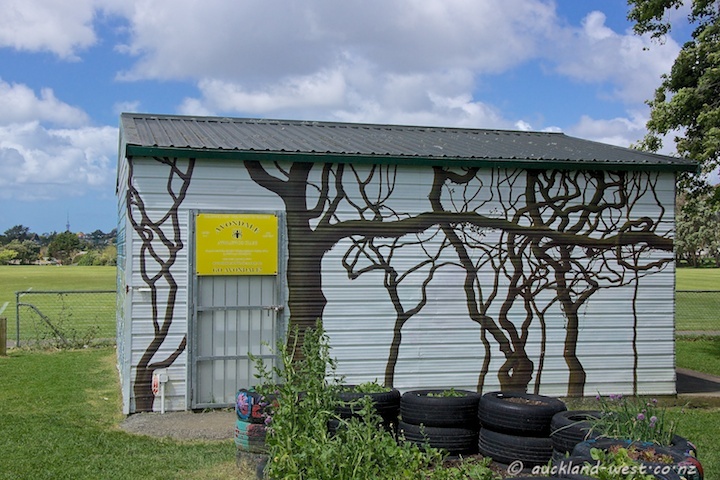 On previous days, Doug had outlined his design on the three walls of the former milking shed (now nursery), and when we arrived he deployed our talents with skill and good humour. You see him in his red hat below. 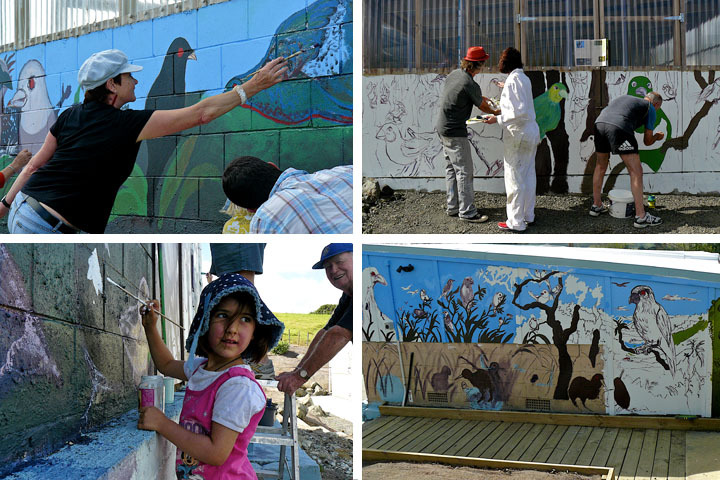 Another group of people was due to continue the work on Sunday, and eventually Doug will clean it all up to meet his artistic standards. 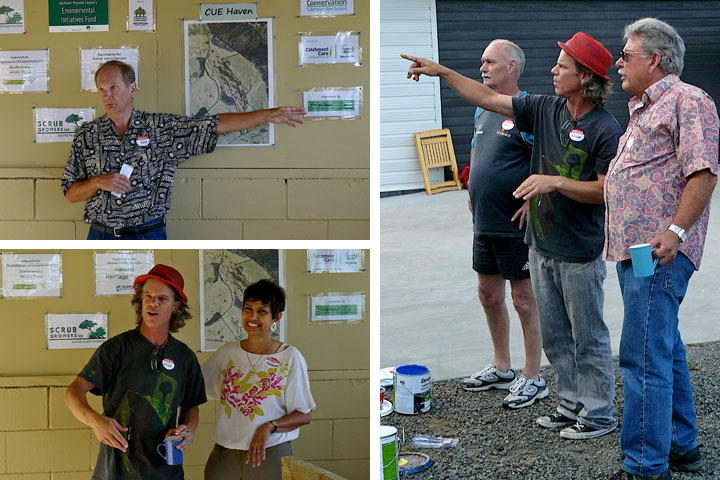 CUE Haven is a 59 acre farm, now being converted back to New Zealand native bush, the vision and initiative of Tom and Mahrukh Stazyk. They were splendid hosts for the occasion, and made evryone feel part of the project. Tom explained some of the developments that had taken place so far, duly acknowledging a number of sponsors (RESENE paints were foremost on our day, of course). Read more about CUE Haven. 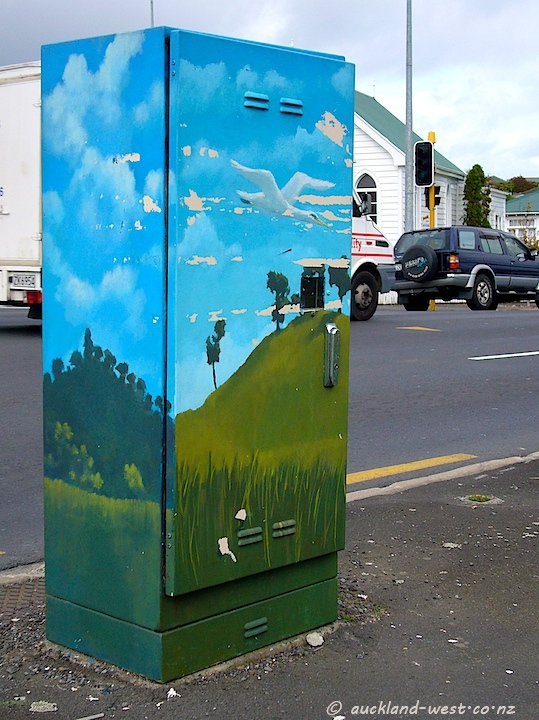 This telecommunications cabinet is in Surrey Crescent, Grey Lynn. The artist is Doug Ford. An unlikely mode of transport across the bush, with lovely birds looking on. 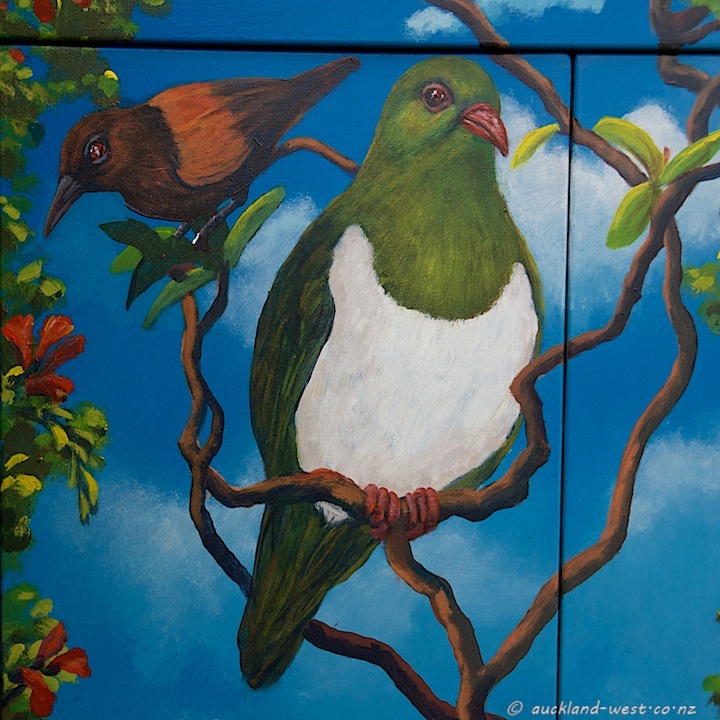 The left hand side panel of the box has a saddleback (left) and a NZ wood pigeon, detail below. 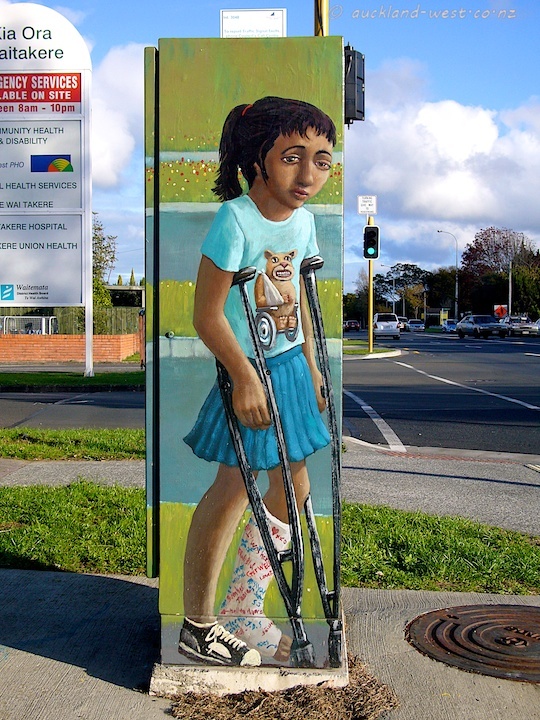 This traffic control cabinet is on Lincoln Road, Henderson, by the entrance to Waitakere Hospital. Painted by Doug Ford (who has featured here before) with great sympathy for the patients. 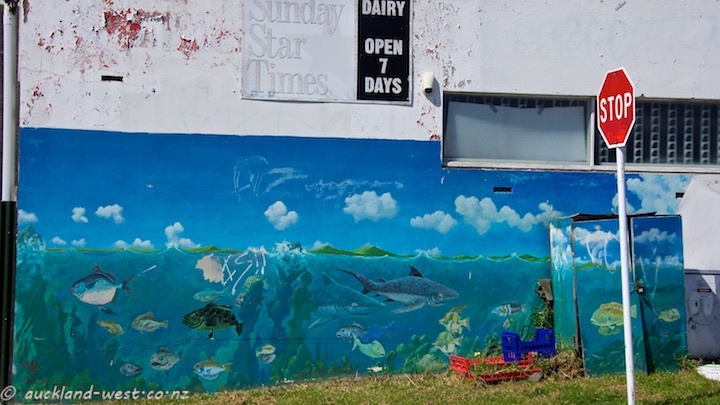 This is a box by Doug Ford, situated where Blockhouse Bay Road meets Great North Road (map). 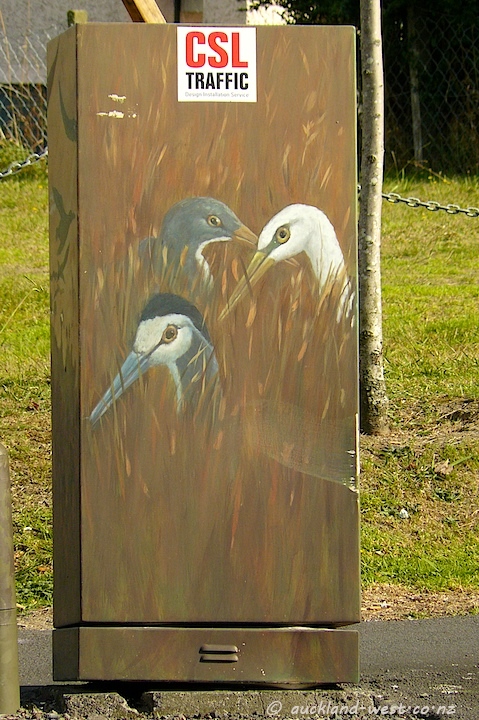 Painted in 2005, it depicts 3 species of herons (white-faced heron, white heron, reef heron – front to back, or if you speak Latin they are Ardea novaehollandiae, Egretta alba modesta, Egretta sacra). On the other side we have a landscape with a white heron in flight, see picture below, where one can see a bit of the Avondale Lions Club in the background. The white heron is pretty rare in this part of New Zealand, but is occasionally seen around the shores of the Manukau Harbour, and it has also been quite some time since I last saw a reef heron. But white-faced herons are abundant wherever there are shores or wetlands. 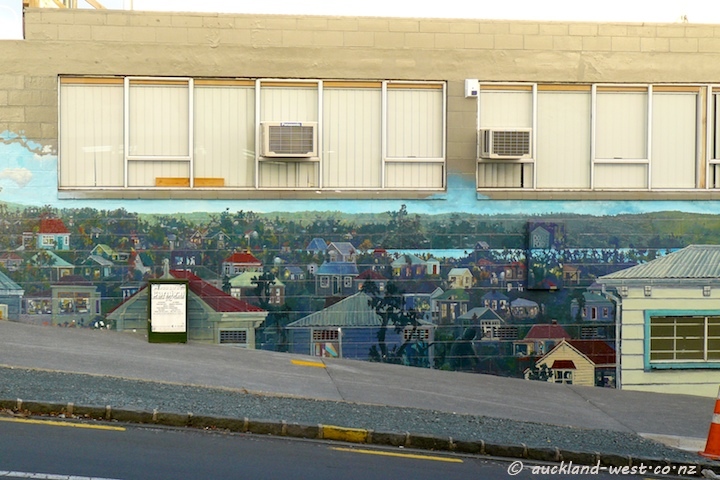 This cityscape on a city wall in Grey Lynn is by Doug Ford whose artwork can be found throughout Auckland and far beyond. It is on Grosvenor Street at the corner with Great North Road (map). 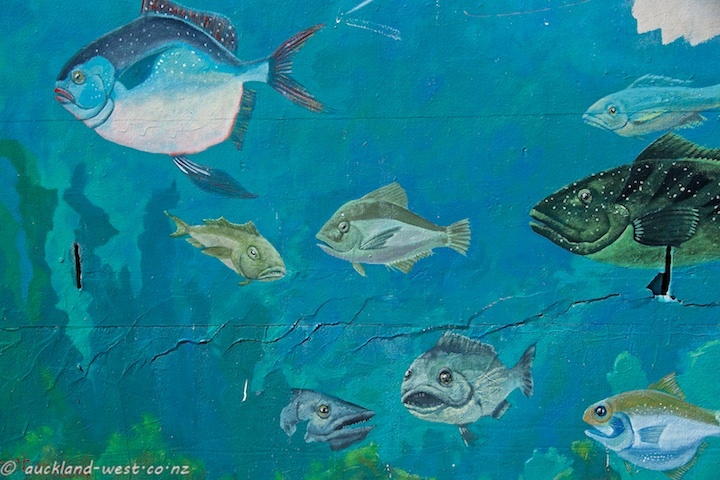 Read more about Doug Ford at The Big Idea or at Wall Gallery, Ponsonby. 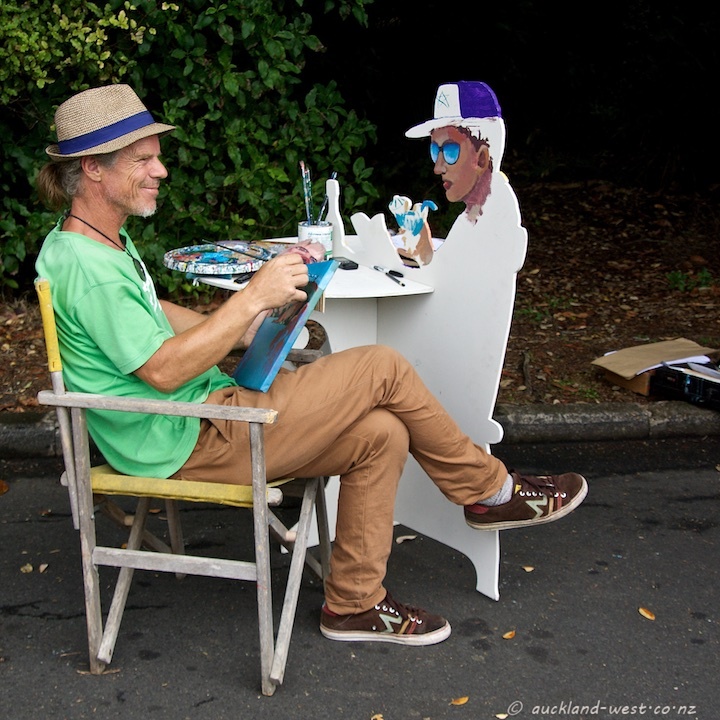 Doug Ford enjoys the extra space beside his gazebo at last Sunday’s Titirangi Market. 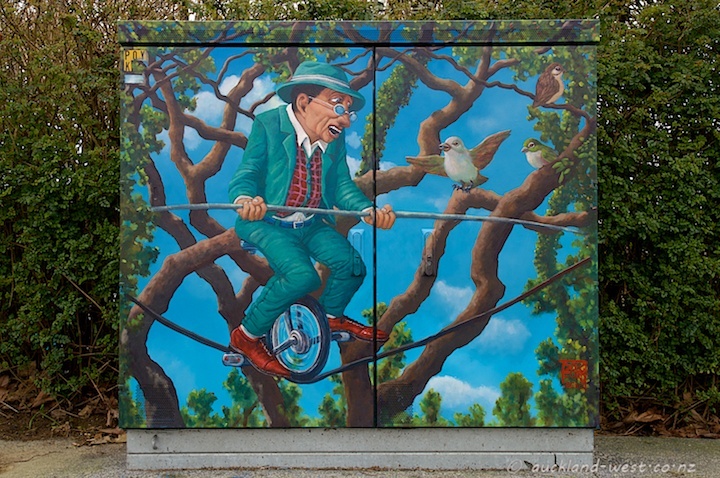 A regular at the market, he is well-known on this blog for his public art in the form of murals and decorated utility boxes. Always a cheerful word when we meet.